DemoCurmudgeon: DNR Sec. Stepp says, "Hey, Wisconsin knows how to do it right," as she backs off protecting our drinking water. DNR Sec. Stepp says, "Hey, Wisconsin knows how to do it right," as she backs off protecting our drinking water. Republican governors should be scary the daylights out of Americans everywhere. They don't care at all about our drinking water, rivers and lakes. Gov. Rick Snyder didn't care about lead in an entire cities drinking water. Yesterday I reported how Gov. 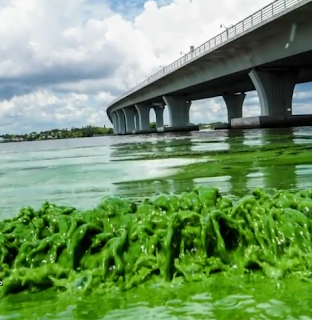 Rick Scott allowed his environmental board to approve dumping more toxic chemicals into Florida's waterways, doing nothing about the huge growing algae bloom problem statewide. Just a sample of media coverage! 1. After Walker’s office notified farm industry lobbyists, the state Dairy Business Association met with DNR officials and complained about the potential cost of new rules, prompting the agency to narrow their scope. 2. Limited plans for reducing manure contamination of public waters despite complaints about excessive dairy industry influence. 3. 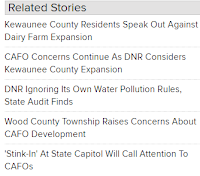 Instead of stronger regulation of manure at CAFOs (concentrated animal feeding operations) statewide, any new rules will apply only in yet-to-be-defined sensitive areas where groundwater is especially vulnerable. 4. The plans were changed without notification of people affected by polluted lakes, streams and wells. 5. Kewaunee County has been hard hit for many years, and residents expressed impatience, but Stepp said the DNR couldn’t begin to act until scientific evidence was in place. 6. Natural Resource Board members said the plan they approved balanced everyone’s interests. “It’s almost like they are almost anti-business and anti-growth,” Member Gregory Kazmierski said. 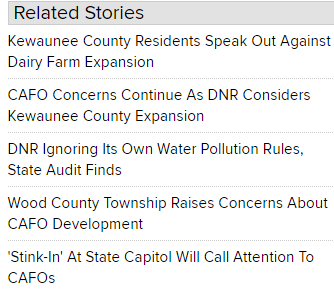 Really, balancing “everyone’s” interests, even Wisconsinites who have had their drinking water contaminated or will have it contaminated when even more CAFO’s are approved? “I know we are going to stand up at the end of the process and say, ‘Hey, Wisconsin knows how to do it right’,” DNR secretary Cathy Stepp said. That's right up there with Tony the Tigers "They're great." This week's special: water quality! WSJ: "But conservationists said the narrowed rule-making plan delayed indefinitely the consideration of public health and water resources protections that were identified through lengthy scientific study and extensive public discussion." But, seriously. "Lengthy scientific study"? "Extensive public discussion"? We'll have none of that, people. Not here in Wisconsin, where neither the government nor the rivers and streams are transparent any more.